Titans 80's & 90s. . Wallpaper and background images in the 틴 타이탄 club tagged: teen titans beast boy cyborg starfire raven titans robin. This 틴 타이탄 photo contains 애니메이션, 만화, and 만화책. I prefer the original Starfire over the cartoon Starfire. The old Starfire looks ugly.The new Starfire is more pretty and she's a sweet and kind person. GEEZZ! 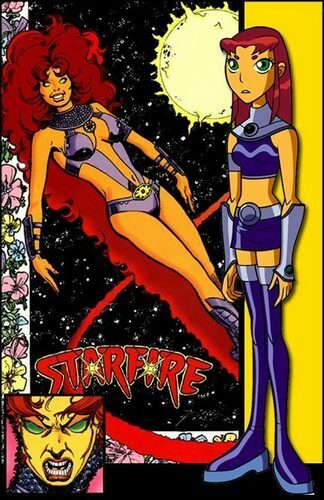 Starfire looks SO UGLY in the comics!